Hummel figurines, produced from as early as 1935 have significantly increased in value since the end of World War II. The porcelain Hummel figurines produced from original images by Maria Innocentia Hummel have today become one of the most popular collectible items in the world. Hummels that consist of more than one figurine along with Hummels that are now over eighty years old are the most sought after amongst collectors. This article hopes to pinpoint just five of the most popular Hummels within a collection of over four thousands to date. 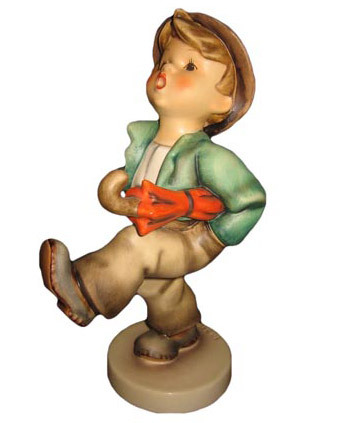 The Merry Wanderer, first modeled in 1935 by Arthur Moeller is thought to be the most popular Hummel. The Merry Wanderer Hummel depicts a young boy carrying a red umbrella and suitcase looking as though he has set off on an adventure. This figurine is now the logo of the M.I Hummel Club and can even be sighted outside the Goebel factory in Germany. The Merry Wanderer has the most variation between all the figurines produced and comes in a number of sizes. Hummel #7 and #11 is a staple piece in most collections. Heavenly Angel is a Hummel which hints at religion first produced as a porcelain figurine in 1935 by the sculptor Reinhold Unger . This figurine due to an open end and has found its popularity around Christmas time as a tree decoration. This figurine shows a girl trying to guard her candle flame from the wind. The figurine was originally named Little Guardian or Celestial Messenger. This figurine was also produced in a white over-glazed version. The Heavenly Angle figurine was also used on a plate in 1971 (HUM264) and a tree topper in 1994 (HUM755). 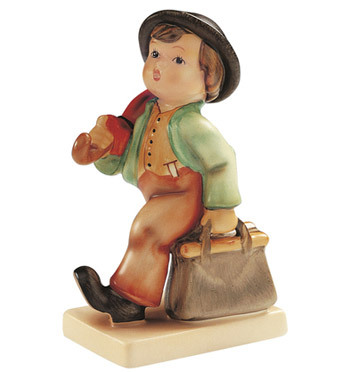 The ‘Happy Traveler’ Hummel figurine was originally modeled in 1938 by Arthur Moeller. This Hummel similar to ‘The Merry Wanderer’ is of a boy walking with an umbrella under arm. The little boy has his left leg held up, his hands in his pockets and head titled backwards. This figurine was originally inspired by German children and can be found in many Hummel collectors’ houses. This is one of the few figurines that has been produced in all trademark time periods. 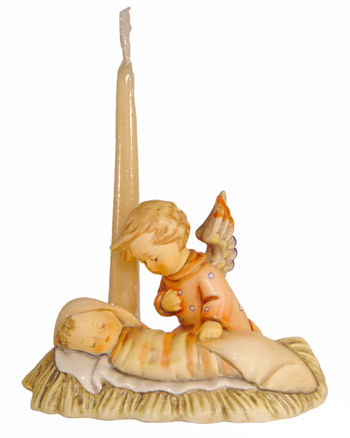 Angelic Sleep is a popular Hummel which is not only a figurine but was also designed in 1935 by both Arthur Moeller and Reinhold Unger. The Hummel includes an angel looking over a infant who lays rest on a cradle of hay. This Hummel was often used as a nightlight when it was first produced. This figurine was also produced in a white over-glazed version that was sold only in Belgium. 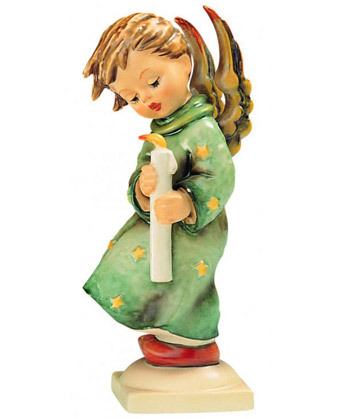 This figurine was listed as Angel’s Joy in older catalogues. 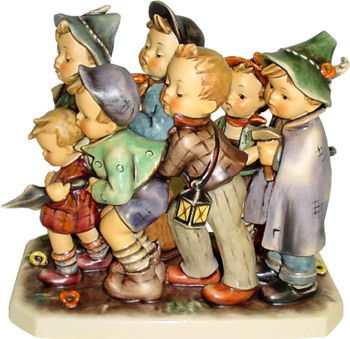 The Adventure Bound Hummel includes seven boys huddled together. The original drawing that this figurine was modeled from was inspired by a Swabian fairy tale and is also called the Seven Swabians. This Hummel was first issued in 1971 to the US market and is now one of the most valuable Hummel pieces a collector can have. This figurine was sculpted by Theo R. Menzenbach but was not released until 1971. Today, Hummel figurines are popular collectible items across the globe with women such as Lady Betty Ford, a former first lady having an extensive collection. Each Hummel has its own value and each collector favors certain Hummels over others. All Hummel figurines are valuable pieces of history even if they do not possess popularity or price.